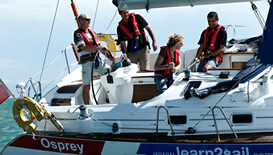 Learn RYA theory online with Navathome a RYA Recognised Training Centre specialising in online training, supported by Learn2Sail – you will be tutored and supported by an experienced RYA Learn2Sail instructor working on behalf of Navathome.com. 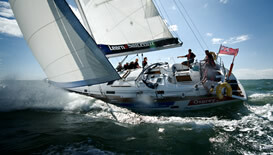 Why choose an online sailing course? Buy online and learn from the comfort of your own home. Freedom and flexibility to study when you want. Online help from Learn2Sail whenever you need it. If you want the freedom and flexibility to study at home, on the train - wherever you have internet access and to be able to study at your own pace - then on line training is for you. You will be supplied with all the course notes required and will have us on line to help you all the way whenever you need assistance. RYA - Day Skipper Theory. Our Day Skipper theory training gives you the introduction on how to navigate a yacht using "traditional methods" in company with modern electronic navigational equipment such as GPS and chartplotters. Introduction to chart work, navigation, meteorology and seamanship. D.R. positions, E.P. estimated positions and course to steer calculations. Learn how to figure out tidal heights and tidal streams and how they affect your course. "Rules of the Road" and how to identify the 'give way vessel' when there is a risk of collision. Passage Planning, pre working your pilotage plans so that you comply with SOLAS V recommendations and assisting you on completing a competent port entry. It's a comprehensive course and will run at your pace in which you will learn how to navigate and be ready for your Day Skipper practical course. The cost of the course is just £295 inc.
Additional charges will apply if a course extends beyond 6 months. Please see our booking conditions here. RYA - Coastal Skipper/Yacht Master Theory. The Yachtmaster theory course is an advanced course which will take you on a thorough revision of the Day Skipper theory and then expand your knowledge thereof. Expand on the knowledge already achieved at Day Skipper level. Learn about stability and passage making offshore. Undertake three assessments – meteorology Chart work and 'Rules of the Road'. Learn the lights, shapes and responsibility between vessels at sea. By the end of the course, you will have all the knowledge and be ready to undertake your Coastal Skipper, MCA Yachtmaster Coastal or MCA Yachtmaster Offshore practical training. Plotter and dividers (available from us at £22 inc - free post and packing UK, oversea rate apply). Between 40 and 50 hours to complete the course. (2 hours a week) put in more time and complete the course faster - your choice. If you would like to enrol on a distance learning scheme please call us on 01227 280082 or send us an e mail on the link below. We'll support you all the way via telephone, on line and Skype.